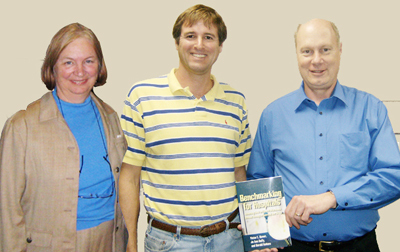 Authors, from left, Jo Ann Duffy, Gerald Kohers, Vic Sower. Sam Houston State University may not have a medical school, but three of its College of Business Administration faculty members can tell you a lot about how to run a hospital. Vic Sower, Jo Ann Duffy and Gerald Kohers found out that, for various reasons, patient satisfaction with hospitals is falling. So they wrote a book to help solve some of their problems through use of a management concept called "benchmarking." Sower said that "benchmarking" is nothing more than a process in which an organization measures its strategies, operations, or internal process performance against best-in-class organizations within or even outside its industry. The book is called Benchmarking for Hospitals: Achieving Best-in-Class Performance Without Having to Reinvent the Wheel. Sower, Duffy and Kohers all teach in the management and marketing department in the College of Business Administration. They found that while hospitals don't need to re-invent the wheel, watching how racing crews change them can improve hospital operations. Sower said that the Great Ormond Street Hospital in London, England, earned top ratings from their Healthcare Commission as the result of an idea that came to two tired surgeons who were watching a Formula 1 race. "They noticed how choreographed the pit crew operations were," said Sower. "They had recently determined that many of the errors in their hospital were occurring during handoff from the operating room to the intensive care unit. They both hit on the idea of benchmarking the Ferrari Racing Crew's pit stop procedure to improve their handoff procedure." In order to come up with their exemplary organization profiles, the SHSU authors did site visits to three of the five hospitals featured, conducted numerous hours of interviews either in person or by phone, and studied data provided by the hospitals. Three of the hospitals have won the Malcolm Baldrige National Quality Award, which is the highest in the United States. Other awards include the Solucient 100 Top Hospitals, Child magazine's 10 Best U. S. Children's Hospitals, the Leapfrog Top Hospitals, and U. S. News & World Report's America's Best Hospitals. Great Ormond Street Hospital in London, England, Formula I pit crew efficiency in emergency room to intensive care transfer. Sower said the idea for the book was the result of the 2006 Press Ganey Report that showed that the "gap in patient satisfaction is widening between hospitals that deliver exemplary patient service and those that provide lower levels of care." The book is available from the American Society for Quality's Quality Press online at http://www.asq.org/quality-press. Its ISBN is 978-0-87389-722-8 and ASQ item number is H1314. Its cost is $52.50, or $31.50 for ASQ members.